Pulsing with the rhythm of his greatest stand-up, Chris Rock's Top Five takes things to the next level, reveling in the high and the low, and blending a star-studded comedic romp with an irresistible romance. 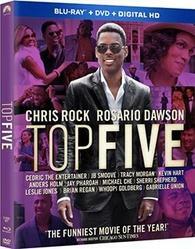 Written, directed, and starring Chris Rock, Top Five tells the story of New York City comedian-turned-film star Andre Allen, whose unexpected encounter with a journalist (Rosario Dawson) forces him to confront the comedy career—and the past—that he's left behind. Starring Chris Rock, Rosario Dawson, Gabrielle Union, Cedric The Entertainer, JB Smoove, Tracy Morgan, Kevin Hart, Anders Holm, Jay Pharaoh, Michael Che, Sherri Shepherd, Leslie Jones. The film is produced by Scott Rudin and Eli Bush. The Co-Producers are Shawn "Jay Z" Carter and Kanye West; the Executive Music Producer is Questlove. On the stage, Chris Rock is easily one of the greatest standup comedians of all time. He effortlessly commands an audience with natural charisma, sharp insights, and hilarious jokes. On the stage, he is an undeniable success. But on the silver screen… well, that's a different story. 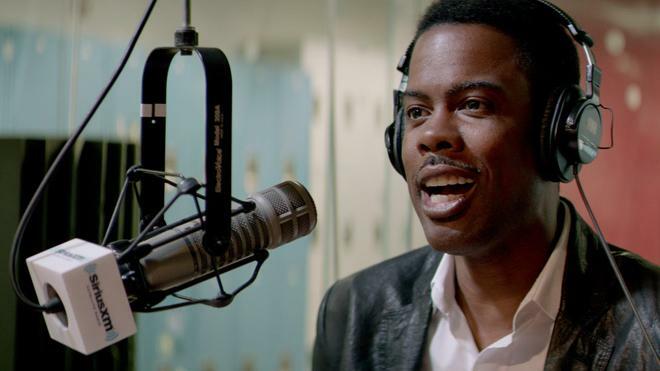 When it comes to movies, Chris Rock has had a rather uneven career, mixing in a few solid turns with a healthy assortment of decidedly lesser efforts. And by lesser efforts, I of course mean complete and utter crap. This brings us to his latest flick, 'Top Five,' where Rock not only takes on the leading role but also steps behind the camera, tackling writing and directing duties for the third time. Thankfully, in this case, it seems like the third time's the charm! Funny, endearing, and wonderfully entertaining, this is a really good movie through and through, finally successfully translating the comedian's unique voice to the big screen. Very loosely inspired by the filmmaker's real life experiences in the entertainment industry, the film focuses on a day in the life of Andre Allen (Chris Rock), a formerly successful comedian who is attempting to branch out into dramatic work. As his newest film premieres in theaters, Allen is joined by a reporter, Chelsea (Rosario Dawson), who shadows him throughout New York City. Question by question, Chelsea learns more personal details about her famous subject, revealing the celebrity's hidden layers, passions, and demons. Forced to reevaluate his career and choices, Allen will have to decide what he really wants out of life -- and who he wants to spend it with. Using the standard Woody Allen romantic comedy mold as his template, Rock manages to inject his singular comedic perspective and style into every frame. Far from the generic studio films he's usually cast in, this really feels like a personal and sincere effort from all sides of the camera. And thankfully, more than merely heartfelt, the movie is damn funny. The majority of the script is dialogue-driven, leading to an amusing series of conversations between Allen and Chelsea that are nicely bolstered by solid walk-and-talk camera work. Throughout it all, Rock's sensibilities shine through with some hilarious observations and witty jabs that address sometimes serious issues like race, addiction, and the pitfalls of fame. A few flashbacks also help to broaden the scope and the film is home to some light reality TV and Hollywood spoofs as well (Allen's character is famous for a series of action comedies that involve him playing a police officer dressed up like a bear). Likewise, the funny dialogue and parodies are joined by some decidedly raunchier elements, including a few crazy sexual escapades that are sure to stick with audiences long after the credits roll. But as hilarious as the film is, the movie isn't afraid of veering off into some legitimately dramatic territory, and Rock handles these tonal shifts remarkably well. Unlike many similar efforts, the emotional beats and conflicts here never feel forced. They're just a natural and genuinely affecting piece of the story, perfectly complementing the humor. To this end, Andre Allen becomes a fully realized character, making it easy to care about his problems, and Rock plays the part with an effortless, down-to-earth appeal. He's a celebrity who has managed to stay mostly grounded, but just like anybody else he's hung up by insecurities and an escalating fear of failure. Together with Dawson's character, the duo gradually prod details about their lives from each other, and watching them slowly bond (and argue) becomes the crux of the film. Both performers seem perfectly at ease together on-screen, instantly selling their connection. 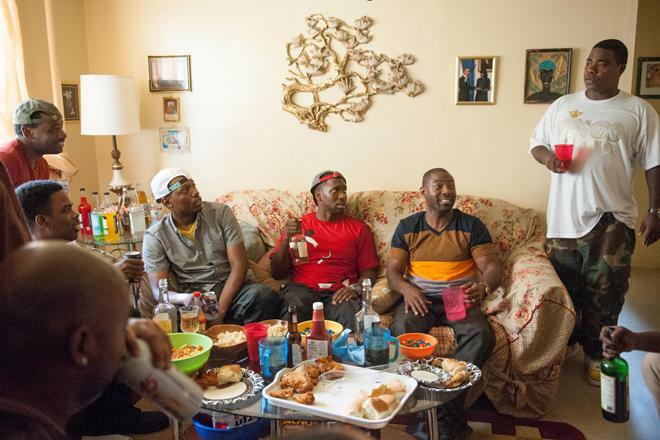 Supporting turns and cameos from the likes of Gabrielle Union, Kevin Hart, Tracy Morgan, J.B. Smoove, and more (that I won't spoil) are all hilarious and memorable as well, helping to round out a great cast with no weak links. Thanks to a surprisingly personal touch and some quick-witted humor, 'Top Five' easily ranks high among last year's most enjoyable comedies. The script packs a lot of heart without ever sacrificing Rock's edgier qualities, bringing the comedian's trademark sensibilities to the screen through an entertaining and well-crafted story. The single day interview structure works perfectly as a framing device, fueling some very funny and insightful observations. Though he was already a master at stand-up, with his latest directorial effort, Chris Rock has fully cemented himself as a genuinely strong filmmaker. Now, let's just hope he keeps it up. We need more good movies like this, and far fewer "interesting" efforts like some of his previous flicks. Paramount brings 'Top Five' to Blu-ray on a single BD-50 disc that comes housed in a keepcase with a cardboard slipcover. A separate DVD and instructions for an UltraViolet/iTunes digital copy are also included. After some skippable trailers, the disc transitions to a traditional menu screen. The packaging indicates the release is region A coded. The movie is provided with a 1080p/AVC MPEG-4 transfer in the 2.35:1 aspect ratio. Clean and nicely detailed, this is a very pleasing picture that avoids any major technical issues. The digital source is crisp and free from any major artifacts like distracting noise or banding. With that said, there is some negligible shimmering here and there, but these instances are so fleeting that they're hardly worth mentioning. Clarity is good throughout, but detail can be on the soft side during certain sequences which use a noticeably diffuse lighting style that can blur the image just a tad. Likewise, dimension also wavers slightly depending on the location and shooting conditions, with some shots exhibiting a comparatively flat look. Colors are nicely saturated, mostly sticking to a natural palette that offers solid pop in the primaries. Contrast is high with deep blacks, and though whites tend to bloom a bit in outdoor scenes, this works in line with the diffuse lighting style. 'Top Five' hits Blu-ray with a strong transfer that eludes most of the usual hiccups found on many digitally shot releases. Some aspects of the picture can be a little uneven, but the overall image is great. The film is presented with an English DTS-HD MA 5.1 track along with English, English SDH, French, Spanish, and Portuguese subtitles. Though a little front-loaded at times, the mix offers effective ambiance and a solid sense of space. Dialogue is clean and well prioritized throughout, highlighting the cast's witty lines and engaging conversations. The soundscape is a little restrained, but general city and club ambiance helps to liven specific scenes with an appropriate sense of atmosphere. Surround activity offers subtle background effects, and the front speakers feature good directionality and natural imaging. An early club scene comes across as a tad reserved with less than engaging bass, but a later Bachelor Party sequence is much more aggressive, providing some deep low frequencies. Likewise, overall range is wide and music tracks come through with strong fidelity and separation. While the soundscape isn't quite as layered or immersive as it could be, this is a dialogue-driven effort and the track offers enough activity to keep things engaging. Paramount has put together a solid collection of supplements, including a commentary and some deleted material. All of the special features are presented in 1080p with Dolby Digital 2.0 sound. Commentary by Chris Rock and JB Smoove – Rock and Smoove offer a fairly informative and entertaining track, touching upon the plot, editing, improvisation, locations, and other bits of production trivia. The pair also joke around a lot and spend a fair amount of time complimenting the cast and crew while pointing out all of the many comedians who make an appearance. It's Never Just a Movie: Chris Rock and Top Five (HD, 20 min) – This is a behind-the-scenes featurette that focuses on Chris Rock's famous comedy background and his parallels to the film's Andre Allen character. We get a few funny archive standup clips, and interviews from Rock and his colleagues that detail his rise through the standup ranks. The Making of Top Five (HD, 10 min) – This featurette offers on-set footage and cast & crew interviews that offer a peek into Rock's directing style and the use of improvisation during the shoot. Top Five Andre Allen Standup Outtakes (HD, 6 min) – Here we get more footage of Rock doing standup in character from the film. This is all really funny stuff that was seemingly cut just for time. Top Five Moments You Didn't See in the Film (HD, 4 min) – This is a reel of a few cut lines, jokes, and other bits and pieces. There's nothing to revelatory here, but we do get a few more funny moments with Tracy Morgan and Kevin Hart. Deleted Scenes (HD, 4 min) – Three deleted scenes are viewable separately or together. This material mostly features Andre Allen being interviewed by Charlie Rose and there's a few worthwhile bits, including some more brief movie parodies. Chris Rock's 'Top Five' is a genuinely funny and engaging movie, finally successfully bringing the comedian's unique voice to the big screen. The video and audio are both good, offering a strong technical presentation. Supplements are also worthwhile, with some amusing behind-the-scenes featurettes and deleted material. Heartfelt, hilarious, dramatic, and edgy at the same time, this is one of 2014's best comedies. Recommended.